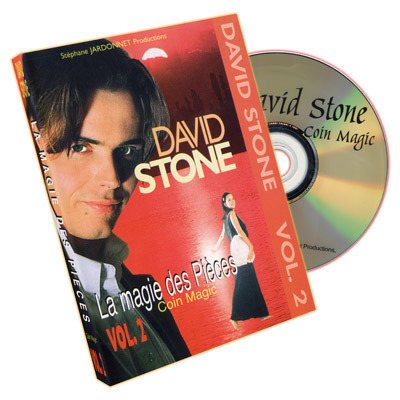 The French magician David Stone is back... with a progressive lesson in Coin Magic and 9 brand new routines, including one of the wildest « Flurry » routine ever made and 25 moves and sleights you can do anywhere, in any stand-up conditions. No expense has been spared : professionally produced and filmed, multiple camera angles, high-quality picture and professional dubbing. More than 85 minutes of professional magic you can use and perform in front of anybody, anywhere. Presentation has not been put aside either : Each routines has its own patter and presentation. David Stone has kept no move, tip or subtlety for himself. As in Vol. 1, Stéphane Jardonnet has captured the best camera shot to help you learn the proper way to use each technique. An invaluable tool for learning coin Magic. Compulsory for the amateur, necessary for the professional, and valuable to any magician ready and willing to explore the world of Coin Magic.